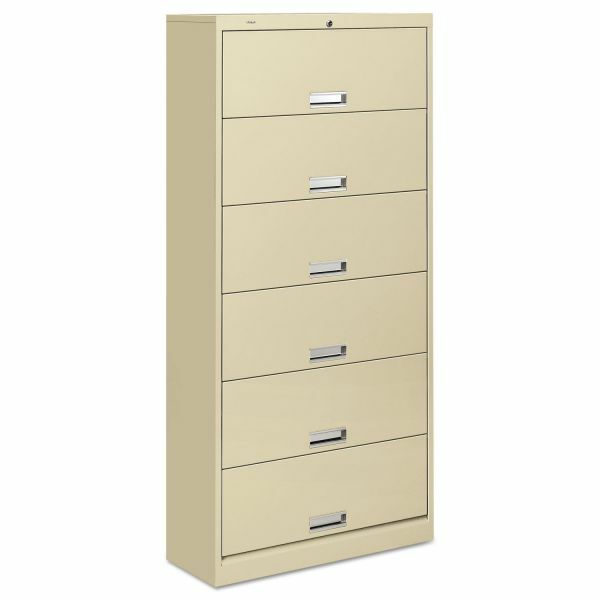 Equivalent to eight 30" wide lateral file drawers. 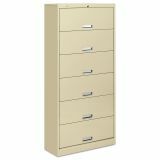 HON 600 Series Six-Shelf Steel Receding Door File, Legal, 36w x 16-3/4d x 75-7/8h, Putty - For high-volume, long term filing. End-tab filing format provides easy access to information. Double-walled, heavy-gauge steel. 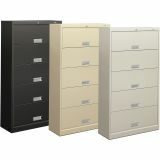 One six-shelf unit offers file capacity equal to eight 30" wide lateral file drawers. Can be ganged back to back. Two wire file dividers per shelf; shown with extra shelf dividers (HON® Brigade™ 600 Series Open Shelf File Extra Shelf Dividers), sold separately. Doors recede on nylon glides. 10 1/8" height between shelf and door. HON® "One Key" interchangeable core removable lock controls all openings. Can be ganged back to back. Doors recede on nylon glides. 10 1/8" height between shelf and door. HON® "One Key" interchangeable core removable lock controls all openings.